Can God save Adam West? « BBC: The end of the Anglo-American order? West died peacefully in Los Angeles after a “short but brave battle” with leukaemia, a family spokesperson said. 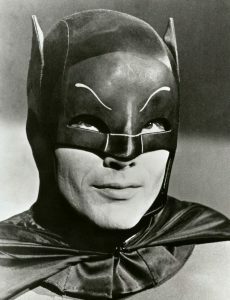 (CNN) Adam West, star of the popular and campy 1960s “Batman” TV show, died Friday night after “a short but brave battle with leukemia,” his family said in a statement. The actor was born William West Anderson in Walla Walla, Washington, and went on to earn a degree in literature and psychology from Whitman College. Working as a disc jockey, West developed a dramatic and memorable voice, which he usedly effectively as the Caped Crusader. “If I pick up a telephone and make an international call, the operator knows my voice immediately, as does everybody else,” he told CNN in an interview two years ago. While I rarely post about the death of American celebrities, since it has been a long time since I did so, I thought I would today. As far as Adam West goes, I do remember him when I was very young playing Batman on television. A couple of years ago, essentially by accident, my wife and I saw him live at an event in San Luis Obispo we were attending. He spent time discussing his life and his career. He also discussed that he played the Batman character the way he did because Batman was simply a comic-strip character and he felt he portrayed that angle in his acting. I do not recall him mentioning anything about religion, but do remember him wanting to have a ‘star’ on the Hollywood walk of fame. At the time he did not have one. As it turned out, he later got one, and by chance my wife and I saw it when we stopped in Hollywood on our way back from a trip to San Diego a few months ago. As I mentioned, Adam West did not discuss religion when we saw him. Perhaps he had some type of Christian faith, perhaps not. If not, is he and the others like him doomed? 31 Therefore I say to you, every sin and blasphemy will be forgiven men, but the blasphemy against the Spirit will not be forgiven men. 32 Anyone who speaks a word against the Son of Man, it will be forgiven him; but whoever speaks against the Holy Spirit, it will not be forgiven him, either in this age or in the age to come (Matthew 12:31-32). It is reasonable to conclude that Adam West (and most others who have already died) did not commit true blasphemy against the Spirit, so can be forgiven. While all will die (Hebrews 9:27), most have been blinded. 41 If you were blind, you would have no sin (John 9:41). But does not the Bible teach judgment after death? 27 And as it is appointed for men to die once, but after this the judgment (Hebrews 9:27). Those not raised in the first resurrection, who were blinded, will be raised again to physical life at the Great White Throne Judgment (Revelation 20:11). Now will all people, including Adam West, be found guilty of sin? But remember, most have been blinded by Satan. Jesus died for all (John 3:16-17). Most will accept Jesus after the second resurrection–after their first real, and unblinded, opportunity. The Bible shows that God will plead with all flesh (Jeremiah 25:31; Isaiah 3:13) and that many who had been blind will respond (Isaiah 42:16-18; 65:24; Ezekiel 11:16-20;36:24-38; Hosea 2:23). Nearly all who were blinded will accept God’s plan of salvation when they fully understand it (Isaiah 42:16-18). I expect that Adam West will as well. Initially, I was not going to cover Adam West’s death at this page, but then decided that some might be interested in understanding how we in the Continuing Church of God view the fate of for those that died and are not part of the true Church of God. What Did Early Christians Understand About the Resurrections? Is there more than one future resurrection? Did early Christians teach a physical resurrection? Did early Christians teach three resurrections? This entry was posted on Saturday, June 10th, 2017 at 3:00 pm	and is filed under Doctrine. Can Jesus save David Cassidy?